A Stationery Studio Exclusive! Make your next celebration extra fun with personalized placemats. 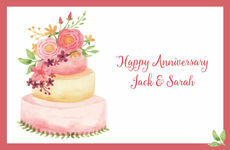 These colorful personalized placemats are available as individual laminated placemats or as a pad of 25 high quality disposable paper placemats you can be proud to use at your next function. Flat printed in ink color as shown with your choice of typestyles. Placemats are 17" x 11". Our heavy-weight laminated placemats are printed on the front and back of the mat. You can wipe them off with a damp cloth for repeated use. Our disposable paper placemats are printed on heavy-weight water resistant 100 lb. cover stock. They are printed on the front of the mat only and the back of the mat is unprinted. Sample shown using BHEH and EERH typestyles.